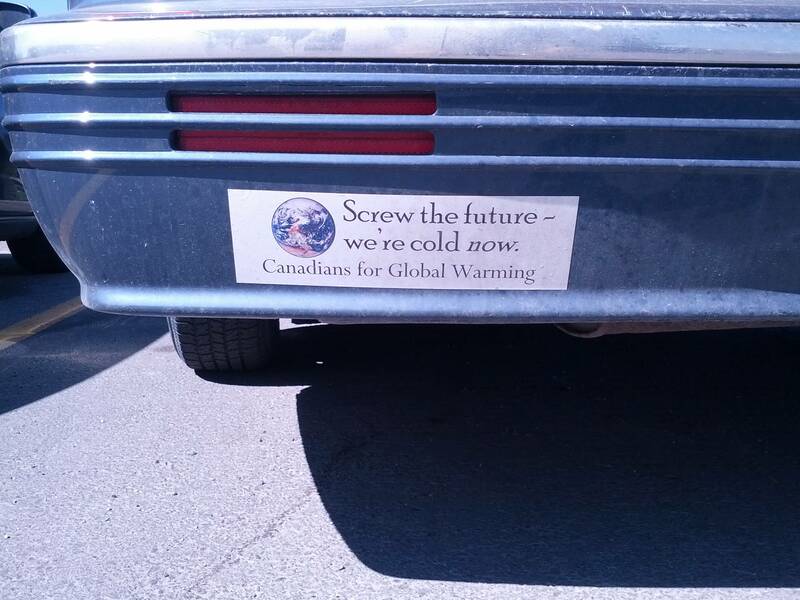 Canada is cold therefore climate change is good. This bumper sticker was posted to Reddit Thursday where users were quick to let out a collective groan. The user who posted the photo, ajau_1, wrote that it was (predictably) taken in Calgary. Not a fan of the bumper sticker? Why not get the T-shirt or mug instead? While Canadians often hear that our cold climate means a warming planet will be a good thing for us, there are some serious holes in the argument. A 2011 report made by the now-defunct National Round Table on the Environment and the Economy predicted climate change will cost the country $5 billion a year by 2020, with costs skyrocketing thereafter. The Tories subsequently killed the group. And while Canadian winters may get more tolerable, it's difficult to imagine that compensating for the increasingly-likely prospect that entire regions of the planet are going to become uninhabitable. Like the planet Mars uninhabitable. Like you can't go there or you'll immediately die uninhabitable. But think of the awesome spring skiing we'll be able to do! That is, if all the residents from the city formerly known as Vancouver don't clog up the lifts. But seriously, winter is way too cold. Bring on the carbon. Right?